If the Indonesian police and military thought shooting live ammunition into a mass gathering of unarmed Papuans would somehow dampen dissent and endear them to Jakarta’s continued rule, they were mistaken. Indiscriminate repression meted out against those gathered at the Third Papuan People’s congress is showing signs of having the opposite effect: widening the circle of dissent inside West Papua and igniting international support outside. First the Indonesian military and police denied they shot dead peaceful protesters. But that was too difficult to sustain. New Matilda received text messages as soon as the shooting started which were followed by urgent phone calls. Gunfire could be heard in the background. When it became clear that covering up the shooting would not wash, the Indonesian Chief of Army in West Papua, Erfi Triassunu, admitted opening fire but claimed his troops only fired warning shots. He insisted no one had been hurt. Some of the international media bought the story. 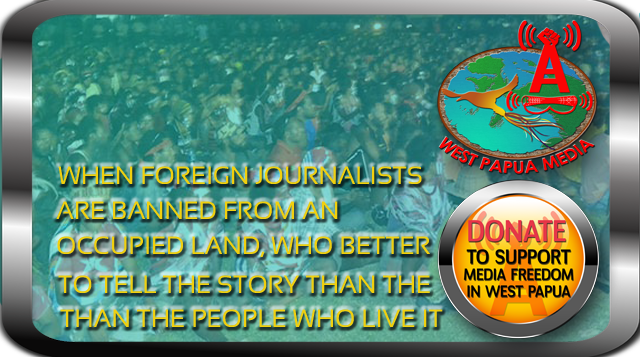 With foreign journalists banned from West Papua, some media outlets went to the police and military for confirmation. This is in spite of the fact that West Papua Media, with their extensive network of citizen journalists and local stringers, broke the story, verified it and began filing reports about what happened within a few hours. A few hours after the shooting, the Indonesian police in West Papua were telling journalists in Jakarta that an attempted coup d’état had taken place and that police had used force to defend the state. The Jayapura Chief of Police, Imam Setiawan, even went as far as saying that members of the Papuan Liberation Army had attacked the Congress. The language used by Setiawan echoed hard-line nationalists in Jakarta. It follows a deadly trajectory. Cast the Papuans in the worst possible light. Label them as “separatists” — which in Indonesia is the worst kind of criminal, someone who is treasonous, dangerous and violent. From here it was only a short step to imply that those at the Third People’s Congress were using violence to try and seize control of the state. This narrative makes it sound like the police and military were taking evasive action to stop the Papuans storming the Bastille of Indonesian rule. This is pure fantasy. Initially it was reported that police and the military raided the stage after Forkorus Yaboisembut and Edison Waromi (appointed as President and Prime Minister of the Federal State of West Papua respectively) declared independence. We now know that the attack did not happen until well after the three-day gathering had finished. After the Declaration of Independence was read around 2.00pm local time, the Congress concluded. The leadership — Yaboisembut, Waromi, Dominikus Surabut, Helena Matuan and a few others left the field to rest in the nearby Sang Surya Catholic Friary in the grounds of the Fajar Timur Theological College where the Congress was being held. Those remaining on Taboria oval (Zaccheus Field) danced the Yospan, a traditional Papuan group dance. The festivities continued for around 60-90 minutes. We don’t know exactly what the police, military and Brimob soldiers were doing between the time the Declaration was read out and the time the shooting started. Presumably they were discussing what to do. Most likely they consulted commanding officers locally and in Jakarta. According to Yan Christian Waranussy, a prominent Papuan human rights lawyer, members of the security forces under the command of Police Chief Imam Setiawan arrested Edison Waromi as he drove out of the Fajar Timur grounds on Yakonde Street. Waranussy reports that the police pulled people out of the vehicle and started beating them before pushing them into a police van. Following the arrest of Waromi, Waranussy says the security forces starting firing their weapons into the crowd. This occurred at around 3.30pm. One of the first killed was 25-year-old Daniel Kadepa, a student at Umel Mandiri Law School. According to those who knew him, Kapeda did not even attend the Congress. He was passing by when the security forces opened fire. Witnesses said that he died from gunshot wounds to the head and back after soldiers fired on him as he was running away. Video footage obtained by EngageMedia and published by New Matilda shows people hiding in nearby buildings just after the police and military opened fire. In the background you can hear shooting. This is not automatic gunfire. They are single shots. Then there is a pause, followed by more shots. It is as if the shooter is walking around picking people off. There is very little background noise. No screaming or yelling, just an eerie silence … and gunshots. According to Catholic clergy who witnessed the event, the police, Indonesian military and the the paramilitary Mobile Police Brigade continued discharging their weapons for approximately 25 minutes. Eyewitnesses report that when the shooting started, Yaboisembut and Surabut were talking and relaxing in the Sang Surya Friary, a few metres from the oval. Then bullets smashed through the window. According to statements obtained by New Matilda people immediately hit the ground and began crawling to safety as the police indiscriminately fired live ammunition and canisters of tear gas into the buildings surrounding the oval. Those present also reported security personal using combat knives or bayonets and beating people with truncheons and rifles. At least 300 people were arrested and taken away in army and police trucks where they were detained overnight in the tennis courts at the police station. We now know that three people were shot dead that day. They are Daniel Kapeda, Max Asa Yeuw, and Yakobus Samansabra. Two others, Matias Maidepa and Yacop Sabonsaba, were allegedly found dead behind the military headquarters in Abepura. According to the Indonesian military sources quoted in the local Papuan press, the victims had been stabbed. In addition, members of the Organising Committee of the Third Papuan Congress allege four other people died, all from gunshot wounds, two from Sorong and two from Wamena. • Forkorus Yaboisembut, chairman of the Papua Customary Council, probably the most prominent pro-independence leader in Papua. When New Matilda interviewed him in West Papua in 2010 and again in 2011 he was regularly receiving death threats. A few people had even come forward and told the local press that they were offered new motorbikes and other inducements if they would help orchestrate a fatal “accident”. • Edison Waromi, president of the West Papua National Authority. Edison Waromi’s daughter, Yane, was kidnapped and assaulted by the security forces in 2008. • Dominikus Surabut, secretary of the Papuan Customary Council in La Pago region. • Selpius Bobii, a social media activist, who organised the Papuan Congress. He initially eluded the police crackdown, but surrendered to police on October 20, accompanied by his lawyers and a Papuan journalist. • August M. Sananay of the West Papua National Authority. • Gat Wanda, a member of PETAPA (Defenders of the Land of Papua, an unarmed civilian defence group), charged with possessing a sharp weapon. It will take some time before the immediate effect of the repression is made clear, but early signs suggest the use of extreme and deadly violence against nonviolent activists has enlarged the circle of dissent inside West Papua and ignited international support outside. Tebay has repeated his call “for all people of goodwill to jointly press for dialogue, for the sake of peace in Papua”. Political representatives of the Papuan Provincial Parliament, a group that until now has sided with the government on matters of national security, expressed their dismay. Bintang Papua reported that Yan Mandenas, chairman of the Pikiran Rakyat Group in the Provincial Parliament said “the actions of the security forces in dispersing the Congress exceeded all bounds and … were in violation of the law”. Similar views were expressed by Ruben Magay, chairman of Commission A on Politics and Law of the Provincial Parliament who reportedly urged the chief of police to withdraw his men because the Congress was already over. Magay said that what happened was clearly “a violation” and that “no one was fighting back”. And while a large group of hard-line nationalists in Jakarta applauded or condoned police and military action, Effendy Choirie and Lily Chadidjah Wahid, both members of House of Representatives Commission I on information, defense and foreign affairs in Jakarta, warned the government that the mounting tension could lead to the province’s separation from Indonesia. In a clear rebuke of Papuan Police Chief Imam Setiawan, the two legislators added “that the government should not blame the Free Papua Movement (OPM) for the shooting but rather the security personnel in Papua”. Internationally, things have gotten much worse for Jakarta. United States Congressman Faleomavaega Eni Hunkin condemned the actions of the security forces. So too has Senator Richard Di Natale from the Australian Greens who has urged the Australian Government to suspend military ties with Indonesia. MP Catherine Delahunty from New Zealand has also called for the New Zealand Government to withdraw its training support for the Indonesian police. This is more than words. The United States, Australian and New Zealand Government all provide money, training and material aid to the Indonesian police and military. In this sense we are beginning to see the early signs of what could become an international withdrawal of legitimacy for continued Indonesian repression in West Papua. Papuan calls for UN intervention won’t happen, at least not in the foreseeable future. And the movement internally still faces serious challenges. But the Congress, the Declaration of Independence and the subsequent shooting has realigned the political landscape. There are now three main political groups, the Congress, the Papuan Peace Network led by Neles Tebay who is calling for dialogue, and the West Papua National Committee who want the giant US/Australian Freeport Mine closed and a referendum on West Papua’s political status. At a fundamental level there is not a lot of difference between these positions. They all point to the need for a political solution to the Pacific’s longest running conflict. The Indonesian political elite and security forces can no longer pretend that the problem in Papua is economic. Papuans want political freedoms. The Congress made that abundantly clear. It opened with raising the banned Morning Star flag and singing the banned West Papuan national anthem, Hai Tanah Ku, and closed with a Declaration of Independence. And it wasn’t as if the military or police was unaware of this depth of feeling. When an open peace conference organised by the Papua Peace Network was held in Jayapura last July, Erfi Triassunu, the local Army Chief, took the podium. In attendance were 800 respected Papuan civil society leaders. Triassunu tried to get the audience — who were mostly Papuan — to chant “peace!” in response to his “Papua!”. But as soon as he called out “Papua!” the crowd responded as one with “Merdeka!” (freedom). Now the Papuans’ cry for freedom is echoing around the world. And it is the Indonesian police, military and their nationalist political allies in Jakarta who are helping amplify it.